I’ve been obsessed with florals for as long as I can remember. I am someone who has always keeps fresh flowers in my home. Now with my professional florist business, I can encourage others to do the same. 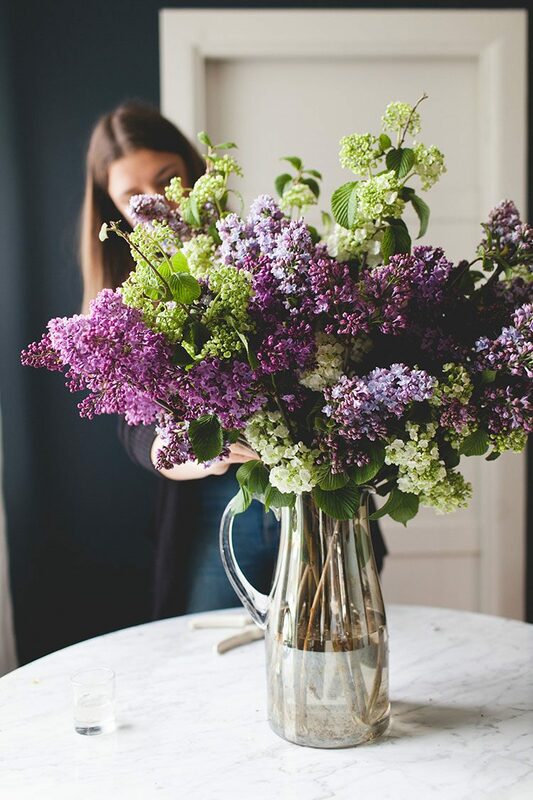 You can imagine just how many flower arranging tips I’ve collected over the years — and long before I became the professional floral designer behind The Stemmery! 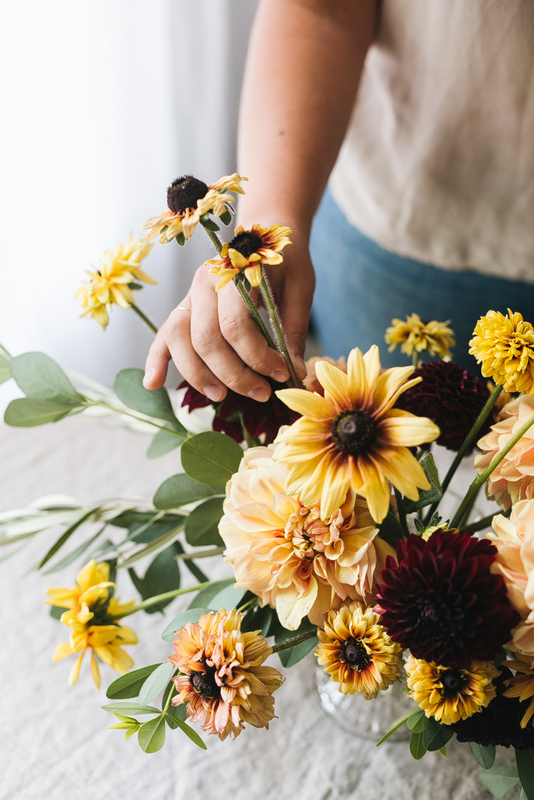 Now that I work with flowers all of the time, I’ve learned even more about how to create a beautiful arrangement at home and how to care for your flowers to help them live as long as possible. Joanna asked me to change things up and share my favorite tips instead of sharing a floral tutorial this month. 1. Always trim flowers at an angle. Prepare your stems by trimming them to the desired length and cutting the ends of the stems at an angle. This helps to ensure that there is maximum surface area for water absorption and also so the stems don’t sit flat against the bottom of the vase blocking water from absorbing. After trimming, place them in water immediately. Some stems quickly form a ‘scab’ over fresh cuts when exposed to air, making it hard for them to absorb water. Some stems don’t do this, but it’s a good rule of thumb to just put all flowers directly into water after cutting them. 2. Remove any foliage that will be below water level. You can usually strip stems pretty easily with your hands, but you may occasionally need to use scissors or floral pruners (keep reading for my list of my favorite tools to use). It’s important to keep foliage out of the water because it causes bacteria growth which will, in turn, cause your flowers to die more quickly. 3. Use a clean vase. If you use the same vase repeatedly for fresh flowers, it’s important to actually wash the vase between bouquets (don’t just rinse, but actually use soap and hot water). Bacteria caused by the decay of your last arrangement can linger causing your new flowers to die much faster than they otherwise would. 4. Refresh the water daily. This extra step can help prolong the life of your blooms, exponentially. When you change the water, you are literally removing bacteria. Depending on your arrangement though, it might be tough to remove your stems from the vase in order to fully replace the water. 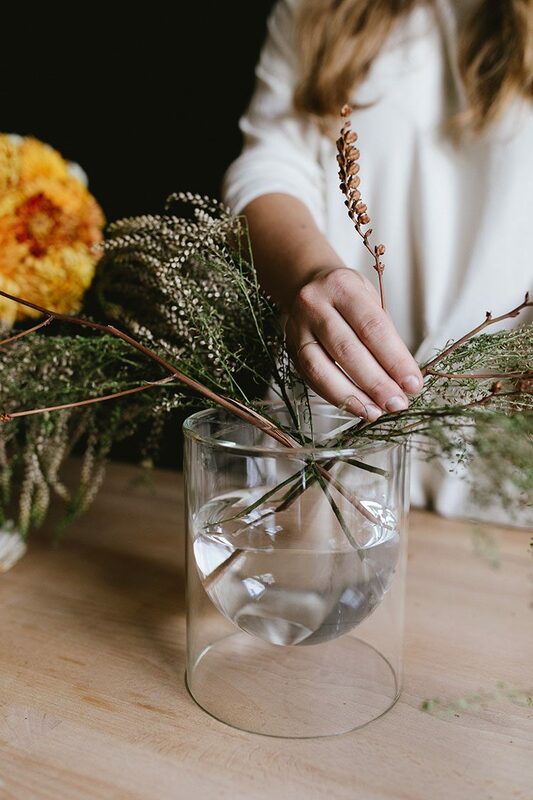 In this case, just add fresh water to your arrangement daily to replenish. 5. Give your arrangement some flower food. You know those little packets you often get when you buy flowers? They’re totally worth using! The sugary formula feeds your flowers and keeps them vibrant longer. You can also buy flower food online to keep on hand for when you don’t get those packets with your flower purchase or if your foraging or cutting from your own garden. 6. Use fresh, local, and seasonal flowers. 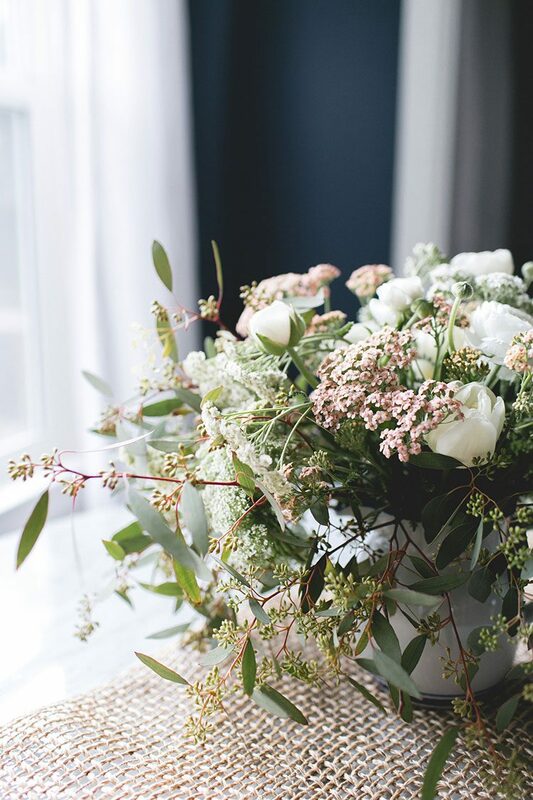 One of the things I love about floral design is that it brings a little piece of the outdoors into our homes. I believe that the most beautiful flowers are those you get closest to your home. Whether it’s beautiful peonies and dahlias during the summer, or evergreen branches and dried hydrangeas in the winter, nature gives us so much beauty to enjoy! 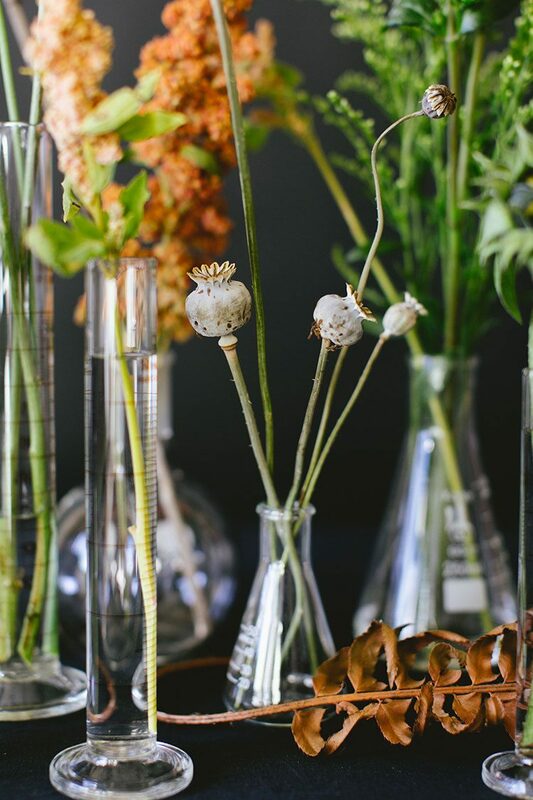 A fun way to make your arrangements interesting is to use non-traditional botanical elements. Blueberry branches, artichokes, or pomegranates are fun options. 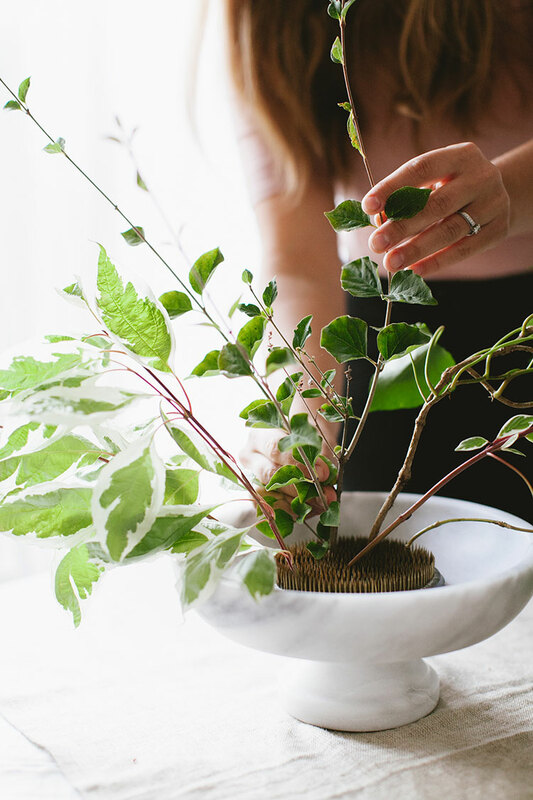 Almost anything that grows can be put in an arrangement — even if you need to use floral stakes or wire to make them work. Get creative with your ingredients! 8. Create a tape grid or use chicken wire. It can be challenging to get your stems to stay in place without a little help. I recommend using a tape grid on clear vases or building a sphere of chicken wire (for extra design control) plus a tape grid on opaque vases. This helps give your flower arrangements structure. You can also use a frog like in this ikebana-inspired centerpiece for an asymmetrical look. 9. Be strategic as you layer elements. Start by creating a base with greenery, adding focal points and then filling in with your remaining ingredients. I’ve detailed this process in most of the floral DIYs I’ve done here on the blog. This fall centerpiece is a great example. Flower pruners — These needle nose snips from ARS are, hands down, the best on the market. They are durable, sharp, and fit well in your hand regardless of being left handed or right handed. For real, these are my #1 recommended tool for floral design. Buy them! You won’t regret it. Branch/thick stem pruners — I also love these heavier duty pruners. I recommend them if you’ll be working with branches or any items with sturdier/thicker stems. Floral Life Crystal Clear Flower Food — As I mentioned before, using flower food is so helpful for keep your flowers alive longer. I always keep a jar on hand. Oasis Clear Waterproof Floral Tape — I’m a firm believer that Oasis makes the best floral tape on the market. It sticks well and comes off easily when it’s time. This is the perfect way to make a grid on a vase. Floral tape dispenser — While you can use scissors to trim your tape, it’s a lot easier to have a dispenser. Especially if your other hand is holding something in place. Chicken Wire — Buy it at your local hardware store! Yes, just standard chicken wire. It can be mashed up to create a rough sphere shape and put inside an opaque vase to hold stems in place. Photography by Meghan Klein. Florals by The Stemmery for Jojotastic.